An entertaining and funny recommended read today about the pitfalls of what we all thought was a really good deal on a cheap flight but turned out to be annoying sixteen steps along the way. I confess after my last "cheap" flight on Frontier to California, I swore, "I am never doing this again." Read: “A 6am flight will be totally fine,” 25 thoughts people have while flying on budget airlines. By Lonely Planet's Travel News section. Say the words travel, vacation or adventure and I get excited for new possibilities. Say the words flying, airport or airlines and a not so pleasant feeling creeps through my body. Is it fear or is it experience? What ever it is, the game to control the outcome of a bad day in an airport and on an airplane is a balance of preparation, luck and a lot of patience. The act of traveling can be exhausting, so I want the airline to help me out, give a sista a hand; don't make it anymore difficult than my already low expectations. The Wall Street Journal released their ratings of top airlines in the U.S.A. in January 2016. Of course I was most interested in delayed flights (missed connections) and mishandled baggage (bikes!). Focus on Alaska, Delta, Virgin America. And maybe not Spirit, American or United (which ... I am flying on to California next month for the Tour of California). The annual scorecard of the nine biggest U.S. carriers shows surprising progress in air travel. By Scott McCartney of The Wall Street Journal and Middle Seat. 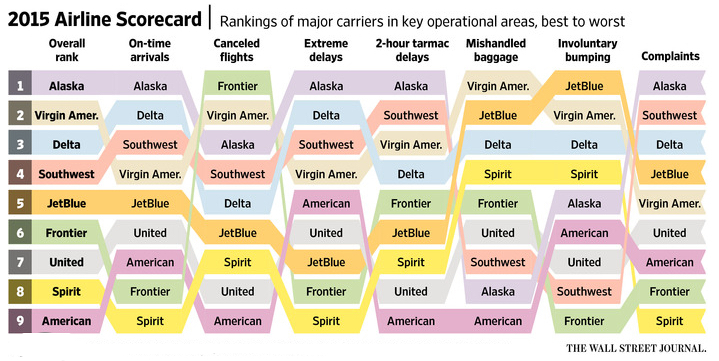 Best and worst airlines, rated. Update 04/26/16: Today from CBS come this list of The 5 most hated and liked U.S. airlines. A heads up on traveling with bikes on airplanes. A reader recently tipped me off that some airlines are now requiring you to pre-approve your bike to determine if they have space. Rob Sabel wrote in: "I was checking the KLM website today and found they, and many other airlines, are requiring pre-approval for bikes. I called KLM and was informed we need to request the bikes to be added to our tickets. They could NOT confirm this could be done and we need to call back Monday to make sure our request was approved! WTF!! Just letting you know, you should check your flights to find out if you need to add a bike to your reservation." Thanks for the update Rob. Today's advice: check with your airline about bike policy, cost, weight limits, loss coverage, and now - possible pre-approval. In reading over some airline baggage requirements today, I learned that the eccentric Antler Guy, Dore Holte, the aircraft mechanic from Seattle, who runs along side the peloton with the enormous antler helmet on his head, pays as much to fly that set of moose antlers as us commons folk do to fly our bikes. Maybe his ram ears cost less to fly?